So as I cover some of the remaining candidates in this, the third and final installment of our “five corners” series on the Democratic field, you’re going to detect a hint of skepticism about most of their chances. (The “five corners” refers to what we claim are the the five major constituencies within the Democratic Party: Party Loyalists, The Left, Millennials and Friends, Black voters and Hispanic voters2; our thesis is that a politician must build a coalition consisting of at least three of these five groups to win the primary.) It’s not that some of them couldn’t hold their own if thrust into the spotlight against one or two other opponents. Instead, it’s that most of them will never get the opportunity to square off against the big names because the middleweights will monopolize most of the money, staff talent and media attention. 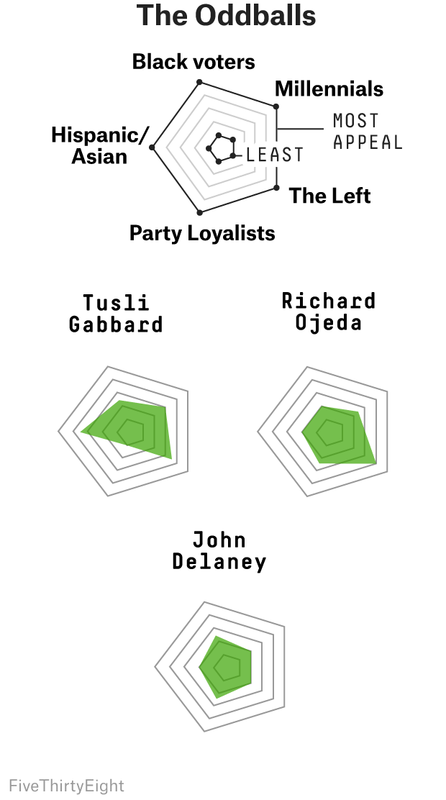 Rather than pretend to be totally comprehensive, in fact, I’m instead going to list a few broad typologies of candidates that weren’t well-represented in the previous installments of this series. This type of candidate has been popular in the minds of journalists ever since Gary Hart’s failed presidential bids in 1984 and 1988 — but it never seems to gain much momentum among actual Democratic voters. In this scenario, a Western governor or senator (e.g. Hart, Bruce Babbitt or Bill Richardson) runs on a platform that mixes environmentalism, slightly libertarianish views on other issues (legal weed but moderate taxes?) and a vague promise to shake things up and bring an outsider’s view to Washington. This platform makes a lot of sense in the Mountain West, but I’m not sure how well it translates elsewhere in the country. In theory, the environmental focus should have some appeal among millennials. (That particularly holds for Washington Gov. Jay Inslee, who would heavily focus on climate change in his campaign as a means of differentiating himself.) And Party Loyalists might get behind an outsider if they were convinced that it would help beat President Trump, but “let’s bring in an outsider to shake things up” was one of the rationales that Trump himself used to get elected, so it doesn’t make for as good a contrast in 2020 as it might ordinarily. The Left isn’t likely to be on board with the Great Western Hope platform, which tends to be moderate on fiscal policy. And while the states of the Mountain West have quite a few Hispanic voters, they don’t have a lot of black ones. It’s not that Inslee or former Colorado Gov. 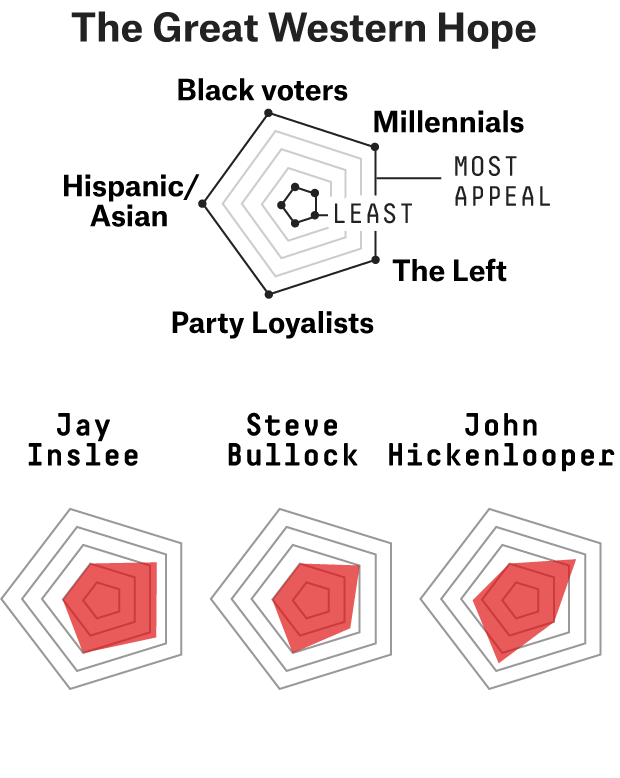 John Hickenlooper aren’t “serious” candidates — being a multi-term governor of medium-sized state is traditionally a good credential — but it’s also not clear where the demand for their candidacies would come from. You might say something similar about the various mayors that are considering a presidential bid.What niche are the mayors hoping to fill, and are there actually any voters there? Maybe in “The West Wing,” a hands-on problem solver from Anytown, USA, would make the perfect antidote to a Trumpian president. In the real world, Democrats think the country is in crisis under Trump, and there are a lot of candidates who have more experience dealing with national problems. But Eric Garcetti and Bill de Blasio, the current mayors of Los Angeles and New York, respectively, have at least had to build complicated coalitions in big, complicated cities — and so they would probably be more viable than the mayors from smaller cities. De Blasio cruised to an easy re-election in New York in 2017 on the basis of support from black, Hispanic and leftist white voters, a coalition that could also be viable in the presidential primary. (De Blasio hasn’t taken concrete steps toward a 2020 bid, but he also hasn’t ruled one out.) Garcetti, who has what he describes as “Mexican-American-Jewish-Italian” ancestry, could find support for his bid among Hispanic voters. Bloomberg might belong in a different group, as someone who’s not just a former mayor but also fits into the entrepreneur/celebrity/rich person category below and has some of the baggage that comes with that. 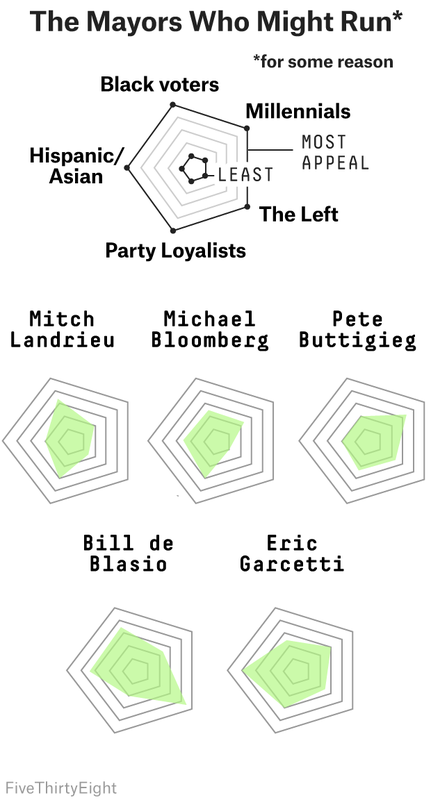 And unlike de Blasio, Bloomberg wasn’t especially popular with nonwhite voters in New York. This is a group of candidates I’m quite bullish about, by contrast — especially Stacey Abrams, if she runs. In defeating longtime incumbent Joe Crowley in the Democratic primary in New York’s 14th Congressional District last year, Alexandria Ocasio-Cortez (who is too young to run for president until next cycle) built a coalition of Hispanics, The Left and millennials. Not that everyone necessarily has Ocasio-Cortez’s political acumen, but the potency of this coalition seems rather obvious, in retrospect. Since The Left tends to be pretty white on its own, a Hispanic, black or Asian left-progressive candidate has more potential to build a broader coalition. 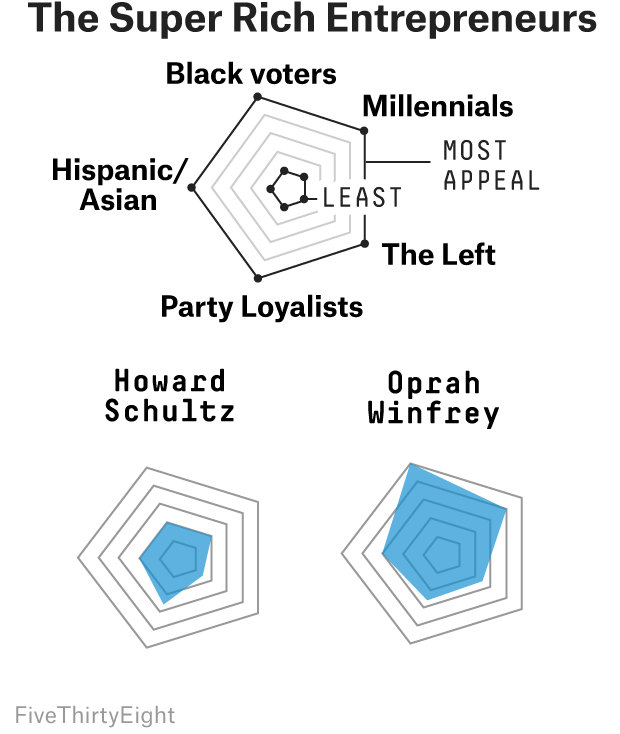 And millennials, who are sympathetic to left-wing policy positions but also care a lot about diversity, might prefer a Latina or a black woman to an older white man. In fact, it’s not clear why, other than for reasons having to do with her race and gender, Abrams isn’t getting more buzz as a potential candidate than Beto O’Rourke. (It’s true that Abrams might have designs on Georgia’s 2020 Senate race instead of the presidency; it’s also true that there wasn’t a “Draft Abrams” movement in the same way that influential Democrats almost immediately called on O’Rourke to run for president after his loss to Ted Cruz.) Both performed quite well relative to how Democrats usually do in their states, with Abrams losing to Brian Kemp by 1.4 percentage points in the Georgia governor’s race and O’Rourke losing to Cruz by 2.6 points in Texas’s Senate race. (Andrew Gillum, who barely lost Florida’s governor’s race, can’t make this claim, since Florida is much more purple than either Georgia or Texas.) Both became huge national stories. And both are lacking in the kind experience that traditionally sets the stage for a presidential run. It’s not that I’m down on O’Rourke’s chances; the opposite, really (see Part 2 of this series). 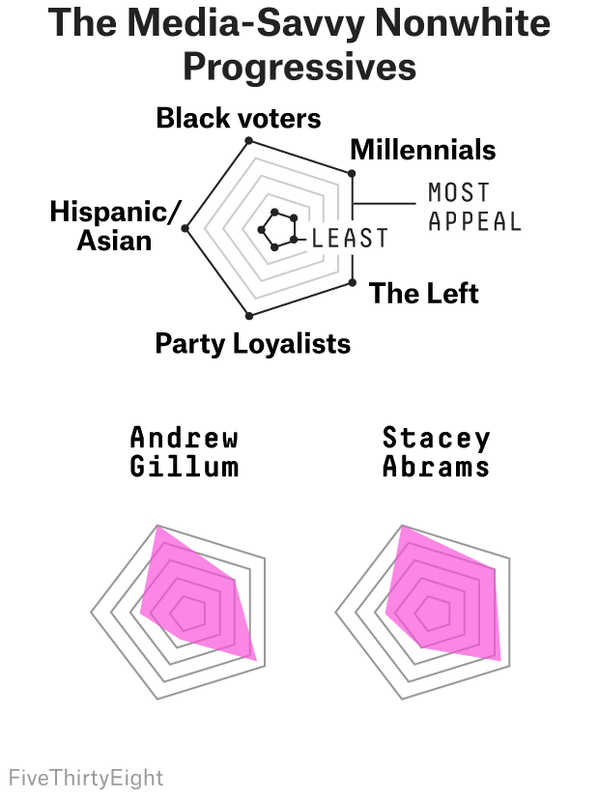 But if O’Rourke can build a winning coalition from millennials, Hispanics and Party Loyalists, Abrams (or possibly Gillum) could create one from black voters, millennials and The Left. I’m not going to spend too much on this category because, in practice, both New York Gov. Andrew Cuomo and former Virginia Gov. Terry McAuliffe are likely to have a lot of problems if they want to ascend to the presidential stage. Party nominations are not just about building coalitions but also creating consensus, and McAuliffe and Cuomo have probably picked one too many fights with liberals and spent too much time critiquing liberal policy proposals to be tolerable to a large enough share of Democrats to win the nomination. 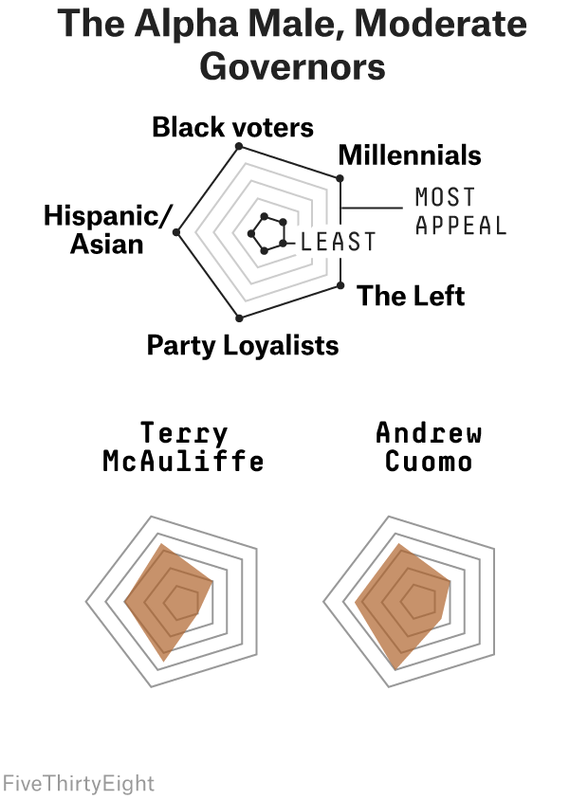 Of the two, Cuomo would probably be the more viable as he’s shifted toward his left recently, although he’d still have a lot of work to do to repair his relationship with progressives. Were it not for their abrasive approaches, the Cuomo and McAuliffe coalitions might be a bit more viable than you might assume. In particular, those coalitions consist of minority voters plus relatively moderate Party Loyalists. Cuomo assembled a similar coalition last September and soundly defeated the more liberal Cynthia Nixon in the Democratic primary for governor before being elected to a third gubernatorial term in November thanks to a landslide 84-14 margin among nonwhite voters. What about the various billionaires considering a presidential run? Count me as skeptical that a CEO title will impress Democrats. Money has never been terribly predictive of success in the primaries (see e.g. Steve Forbes or Jeb Bush) — and candidates such as former Starbucks CEO Howard Schultz and Tom Steyer, the hedge fund billionaire who last week decided that he wouldn’t run for president, have fared notably poorly in early surveys of Democrats. And that makes sense, because it’s not really clear what sort of Democratic voter they’re supposed to be appealing to. The Left is likely to regard the billionaires suspiciously, at best. Nor are rich white men who have never run for office before liable to have a lot of initial success in appealing to black or Hispanic voters. Finally, their timing is poor given that the president is Trump and that the last thing most Democrats will want is another billionaire with no political experience. Want a billionaire whose chances I’d take seriously? How about Oprah. One three-pronged coalition we haven’t discussed yet is one consisting of Black voters, Hispanic voters and Millennials and Friends; a nonwhite celebrity who was able to engage voters that didn’t ordinarily participate in primaries3 could potentially win on that basis. Finally, there are a few people running for president who don’t have anything resembling the traditional credentials for doing so, but who at least have pitches that are a little different than what voters will be hearing elsewhere. Tulsi Gabbard, the four-term representative from Hawaii’s 2nd Congressional District, was one of Sanders’s early endorsers last cycle, but she also has a heterodox set of positions, such as her frequent defenses of Syrian president Bashar al-Assad and her former opposition to gay rights, that won’t win her fans among any of the traditional Democratic constituencies. Richard Ojeda, a crew-cut Army veteran and former West Virginia legislator who says he voted for Trump in 2016 and looks the part of a (stereotypical) Trump voter, is presenting what’s essentially a left-wing set of economic policies in a very different package than voters would normally to get that message from. I’m not quite sure how the pitch would go over if, say, Ojeda makes it to a debate stage, which might never happen because the Democratic National Committee and the networks might consider him too obscure. But it’s worth bearing in mind that The Left is the whitest and most male of the Democratic constituencies, so a candidate who intentionally plays into that identity might not be the best one to build bridges to the rest of the party. Then there’s John Delaney, who decided not to run for re-election to Congress so he could run for president instead — and in fact has already been running for president for well more than a year. He’s preaching a message of bipartisanship, which could win him plaudits from the pundits on the Sunday morning shows, but which it’s not clear that many actual Democrats are looking for. Instead, more Democrats are willing to identify as “liberal” than had been in the past and fewer say they want a candidate who compromises. That’s all for now! As I mentioned in the first installment of this series, some things we’ve written here are surely going to seem laughably wrong in retrospect. It wouldn’t necessarily have been obvious at this point four years ago that Clinton would do so well with black voters, for example (a group she lost badly to Barack Obama in 2008), or that Sanders would become such a phenomenon among millennials. Fundamentally, however, the U.S. has “big tent” parties, consisting of groups that may not have all that much in common with one another. And so, the nomination process is a coalition-building process. Candidates such as Sanders and Joe Biden, who poll well among one or two groups, may lead in the polls initially. But ultimately the candidate who wins the nomination will be the one who can best bridge the divides between the different constituencies within the party. Sometimes in conjunction with Asian voters. Among our five groups, The Left and Party Loyalists are the most politically active, so there is less to be gained through turnout alone among those groups.